Growing popularity of GaN power devices due to enhanced performance among industry applications and requirement of enhanced battlefield performance has driven the global GaN power devices market. The global GaN power devices market is anticipated to expand at a CAGR of 17.5% during the forecast period from 2017 to 2025. The global GaN power devices market was valued at US$223.50 mn in 2015 and is expected to rise to US$1.4 bn by 2025. The GaN power devices market has been segmented on the basis of component, industry vertical, and region. On the basis of component, the market is segmented into GaN power discrete devices, GaN power ICs, and GaN power modules. The GaN power discrete devices segment is further sub-segmented into GaN power RF devices and GaN power non-RF devices. GaN power ICs are further classified into MMIC and hybrid. In 2016, GaN power discrete devices accounted for a share of approximately 52.6% in the total revenue of the GaN power devices market. However, the GaN power modules segment is likely to account for 49.3% of the GaN power device market revenue by 2025. 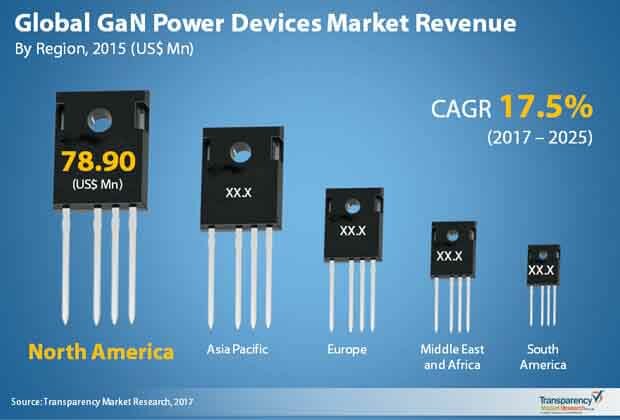 The GaN power modules segment is expected to show significant growth at a CAGR of 19.5% during the forecast period due to its performance benefits over silicon carbide (SiC) devices. On the basis of industry vertical, the market is segmented into consumer electronics, IT and telecommunications, automotive, aerospace and defense, and others. Cost-effective design and enhanced performance is the major concern for these industry verticals. The consumer electronics segment leads the GaN power devices market with a total market share of 35.9% in 2016, followed by IT and telecommunication and aerospace and defense. However, with the increase in application areas of GaN power devices, the automotive industry is anticipated to show substantial growth, growing at a CAGR of 20.5% in the 2017-2025 forecast period. Geographically, the global GaN power devices market is dominated by North America, which has emerged as the key regional segment thanks to the steady support for development of battery technology itself as well as several flourishing application segments of the GaN power devices industry, such as the electric vehicles market and the smartphones market. The North America GaN power devices market, valued at US$78.9 mn in 2015, is expected to rise to US$459.2 mn by 2025 at a 16.6% CAGR in the 2017-2025 forecast period. Nevertheless, Asia Pacific is likely to emerge as the dominant regional player in the global GaN power devices market in the coming years, with the regional market expected to exhibit a 19.9% CAGR between 2017 and 2025. The market’s revenue, valued at US$66.6 mn in 2015, is expected to rise to close to US$520 mn by 2025. The global GaN power devices market comprises large as well as mid-level vendors, including Efficient Power Conversion Corporation, NXP Semiconductors N.V., GaN Systems Inc., Texas Instruments, and Infineon Technologies AG. These companies have been able to establish a strong presence globally. Several vendors in the GaN power devices market are currently emphasizing on new product and process development to meet various demands of their customer base and to continuously improve the quality and reliability of their products. Moreover, vendors are adopting partnership and collaboration strategies to proficiently compete in multiple regional markets. The market is expected to witness the entry of a significant number of vendors of GaN power devices in the coming years, intensifying the competition. Other significant players in the market include Fujitsu Limited, Transphorm Inc., Cree Incorporated (Wolfspeed), OSRAM Opto Semiconductors GmbH, and Qorvo, Inc, among others.